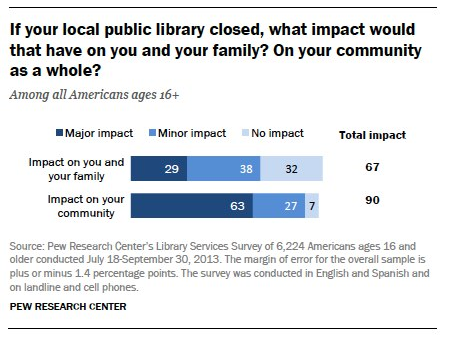 Last month the PEW Internet & American Life Project published some revealing statistics about how Americans value public libraries in their communities. I’ve highlighted a few statistics that jumped out at me, outlining the importance of libraries to rural communities like those found throughout Alaska. 94% of Americans say that having a public library improves the quality of life in a community. For many of Alaska’s remote rural locations the library is the center for the community, providing access to the Internet, among many other benefits and services. 81% of Americans say that public libraries provide many services people would have a hard time finding elsewhere. Many of Alaska’s remote rural communities cannot afford the high cost of Internet for their homes. The library is the only place they can access advanced technology resources. 56% of Internet users without home access say public libraries’ basic technological resources (such as computers, Internet, and printers) are “very important” to them and their family, compared with 33% of all respondents. The library is not only there for the community, but for those that travel in and out of rural/remote Alaska. These statistics reinforce the value in programs such as Alaska Online with Libraries (OWL). Alaska launched the OWL program in 2011 to help bring equity for libraries across the state with an Internet/Video Conference network providing access for all Alaskans. This ambitious state-wide endeavor provided video conference equipment, computers, and bandwidth to improve the computing capabilities of public libraries. OWL has been funded by the U.S. Department of Commerce’s Broadband Technology Opportunities Program, the Bill and Melinda Gates Foundation, the Rasmuson Foundation and the Alaska State Library. Recently, Alaska governor Sean Parnell presented his FY2014 budget for Alaska. This budget includes a line item for funding the OWL network so that libraries across Alaska will be able to continue to provide patrons and community members with access to the world. You can read more about the Alaska OWL Project and its impact on communities in my employer GCI SchooAccess’ case study. Alaskans have come to rely on the libraries within their communities to connect them with the rest of the world. I’m happy to see that Americans in other parts of the country continue to find value in these important community hubs, particularly for some of the same reasons.